Already the area's trusted painter, Watson's Painting & Waterproofing Company also provides light carpentry services! We'll help you add a touch of elegance to any room with simple enhancements, such as Installing crown moldings. The painting professionals here at Watson's Painting & Waterproofing Company are skilled in installing all types of trim and moldings to create classy accents to home. Adding chair rails in dining rooms and wainscoting in restrooms are popular choices. We take great care in preparing all surfaces prior to installing moldings and wood trim. Watson's Painting & Waterproofing Company prepares surfaces by sanding, priming and painting as required. Freshen up your home today with light carpentry, such as wood accents. Is the paint on your baseboards and door jams dented, chipped or just outdated? 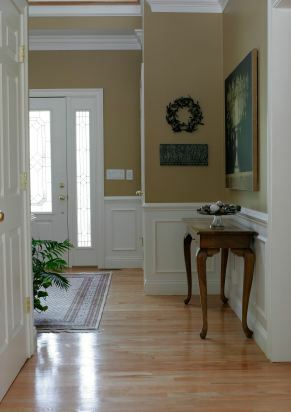 The light carpentry craftsmen at Watson's Painting & Waterproofing Company can freshen up your interior by painting or re-staining your existing wood trim or removing it and replacing with new moldings and trim. Call today for a free estimate and we'll help you come up with a cost effective solution to update your home. Installing or painting interior and exterior doors is another great way to update your home's look without spending a fortune. The Painters here at Watson's Painting & Waterproofing Company are experienced in completing light carpentry work. We would be happy to arrange an in home consultation to discuss your carpentry needs. We can assist you in choosing trim and door styles and paint textures and colors. The work will be performed professionally, and always at a fair price.